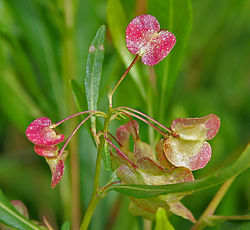 Dodonaea viscosa subsp. elaeagnoides (Rudolphi ex Ledeb. & Adlerstam) Acev.-Rodr. ^ a b c d e f g h i j k l 佐竹ら (1999). ^ a b c d 塩田 (2007). ^ a b c d e f Beentje (1994). ^ a b c McDonald & Weissich (2003). ^ a b c d ブリッケル (2003). ^ a b c d e f Kokwaro & Johns (1998). ^ a b c d e Mbuya et al. (1994). ^ a b Bein et al. (1996). ^ a b c d Katende et al. (2000). ^ Maundu & Tengnäs (2005). ^ a b Benson (1964). ^ a b Leakey (1977). ^ a b Sullivan (2004). Beentje, H.J. (1994). Kenya Trees, Shrubs and Lianas. Nairobi, Kenya: National Museum of Kenya. ISBN 9966-9861-0-3. http://www.nzdl.org/gsdlmod?e=d-00000-00---off-0unescoen--00-0----0-10-0---0---0direct-10---4-------0-1l--11-en-50---20-about---00-0-1-00-0--4----0-0-11-10-0utfZz-8-10&a=d&c=unescoen&cl=CL1.6&d=HASH01b88f73433d5003648dbf5b.12.84. "mũrema-mũthũa", "mũrema-ngigĩ" In Benson, T.G. (1964). Kikuyu-English dictionary. Oxford: Clarendon Press. p. 377. NCID BA19787203. Hassler, M. (2018). World Plants: Synonymic Checklists of the Vascular Plants of the World (version Apr 2018). In: Roskov Y., Ower G., Orrell T., Nicolson D., Bailly N., Kirk P.M., Bourgoin T., DeWalt R.E., Decock W., Nieukerken E. van, Zarucchi J., Penev L., eds. (2018). Species 2000 & ITIS Catalogue of Life, 30th October 2018. Digital resource at http://www.catalogueoflife.org/col. Species 2000: Naturalis, Leiden, the Netherlands. ISSN 2405-8858. Kokwaro, John O.; Johns, Timothy (1998). Luo Biological Dictionary. East African Educational Publishers. p. 91. ISBN 9966-46-841-2. https://books.google.co.jp/books?id=vUC4yJgPtXoC&pg=PA257&dq=ng%27ielo&hl=ja&sa=X&ved=0ahUKEwiJiuOm1YHfAhWVMt4KHTrLCp8Q6AEIOjAD#v=onepage&q=Dodonaea&f=false. Leakey, L. S. B. (1977). The Southern Kikuyu before 1903. London and New York. p. 1341. NCID BA10346810. https://books.google.co.jp/books?hl=ja&id=I5lyAAAAMAAJ&dq=munyururu&focus=searchwithinvolume&q=murema-muthua. Quattrocchi, Umberto (2012). CRC World Dictionary of Medicinal and Poisonous Plants: Common Names, Scientific Names, Eponyms, Synonyms, and Etymology. Boca Raton and London and New York: CRC Press. pp. 1454–1456. ISBN 978-1-4822-5064-0. NCID BB09914640. https://books.google.co.jp/books?hl=ja&id=-37OBQAAQBAJ&dq=mukoigo&q=Dodonaea#v=snippet&q=Dodonaea&f=false. Sullivan, Michael J. (2004). The Trees of San Francisco. Petaluma, CA: Pomegranate Communications. p. 36. ISBN 0-7649-2758-2. NCID BB15605378. https://books.google.co.jp/books?id=FxRN7O5xlqsC&pg=PA36&lpg=PA36&dq=hop+bush+lava&source=bl&ots=UvDQURo8yA&sig=2uxuobWyK1qng_pBG8U2G6mbAuI&hl=ja&sa=X&ved=2ahUKEwiCsdz6pYjfAhUCAogKHZiZB34Q6AEwDXoECAAQAQ#v=onepage&q=hop%20bush%20lava&f=false.